We are using Inifinispan cluster with jgroups-tcp configuration in one of our setups. Sometimes we are observing that the coordinator status in jconsole is showing as unavailable, but this is not affecting any of the functionality. However, I'm just curious as in why the status is showing as unavailable. Any pointers would be appreciated. 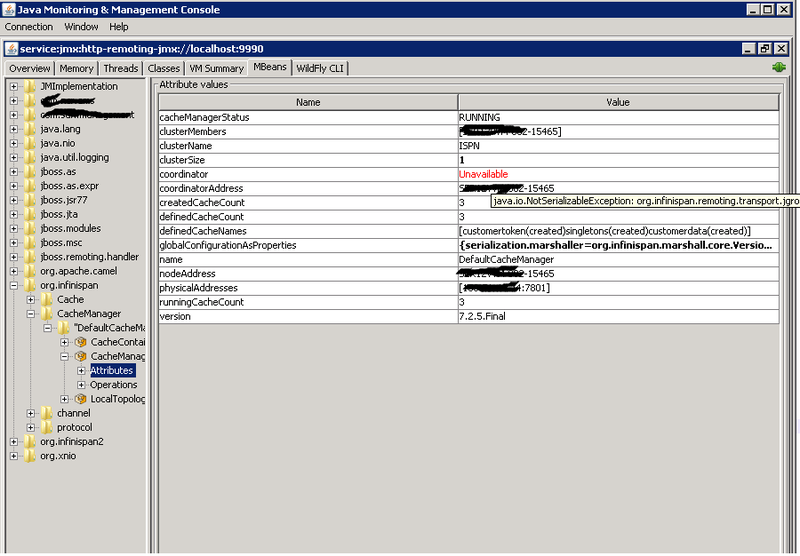 This is probably because the type of coordinator cannot be displayed by jconsole. E.g. if the type was org.jgroups.Address, then this class would have to be added to the classpath used by jconsole. Actually, I'm not sure about my last statement, but googling for jconsole and custom types might be helpful. Not the answer you're looking for? Browse other questions tagged infinispan jgroups or ask your own question. Jgroups cluster works for few hours/couple of days and then fails sending messages.